CENMAC has established partnerships with a number of developers and organisations involved in Assistive Technology and communication. This allows us to keep up-to-date with new products and to have the latest information on strategies for using them. We can also actively support policy and implementation. Our equipment bank allows us to demonstrate hardware resources to schools, therapists, students and parents. We use a wide range of software programs and apps and we are able to advise on how they can be used to meet individual students needs and on how schools can implement them more widely. 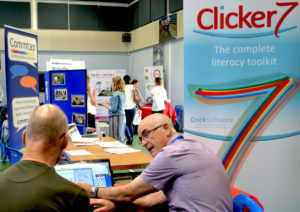 CENMAC is also a Clicker Education Partner. We have links with the software publisher Crick Software to ensure that we receive training on the latest products and are consulted on new developments. We run frequent training courses on the Clicker 7 program. We also give advice and guidance on the use of the Clicker Apps suite and the DocsPlus program. CENMAC is a Widgit Centre. This makes us part of a network of organisations based around the country who offer advice and support on products from Widgit Software. We can demonstrate and offer guidance and training on the In Print 3 and Symwriter 2 programs. We also give general advice on using symbols to support communication and access to the curriculum. The Assistive and Augmentative Communication Special Interest Group is an organisation under the auspices of the Royal College of Speech Therapists. It meets three times a year to hold study days around various aspects of the subject. Ann Middleton is a member of the committee. See www.aacsig.org.uk for further details. Recently we have been pleased to establish a partnership with The Examination Officers Association, we are committed to provide help, support, information and guidance that facilitates greater access to exams for SEND students, especially in relation to assistive technology. We look forward to developing this link.